UK's National Programme for IT in the NHS Known Doomed at Outset? ... I can add that if this initiative [the U.S. multibillion dollar ARRA push towards national healthcare IT by 2014] blows up as it has in the UK, then the only triumph will be the financial triumph of the trade group and its apparatchiks. The losers will be the administration, patients, clinicians, and everyone else in the healthcare system. 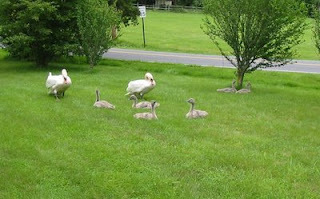 ... Gateway reviews are mini-audits at critical stages in projects. The reports in question gave a red, amber or green status at each stage to help the project’s senior responsible owner decide whether to move to the next phase. the NPfIT was probably doomed from the start, in Spring 2002. As one Gateway Review put it, many dedicated people were working hard on building the components for a car that hadn't been designed. To some extent that's still true today. the initial plan was for new IT - not for changes to the way people work. So the preoccupation was with IT and not patients. It was hoped that new IT would drive change. But that rarely if ever succeeds. that the costs and complexity were initially underestimated - by about £7bn - because nobody had an understanding of what was needed. that speed was unduly important. One gateway review suggested that key staff didn't have time to take action on recommendations or learn lessons. the programme as a whole, according to one Gateway Review, was not assessed against a list of Common Causes of Failure, as published by the National Audit Office. Only individual projects were assessed against the list. How many of these findings apply in the U.S. Health IT program in 2009? Finally, about the aforementioned May 2009 post, Matthew Holt of the Healthcare Blog wrote that I had "gone loopy", i.e., crazy (see footnote to the above-linked May 2009 post). The Chairman of CCHIT Mark Leavitt wrote that concerns about health IT are expressed by "fearmongers" and should be "laughed off." These cavalier attitudes are a major part of what has gone wrong in HIT, as well as our society more generally. 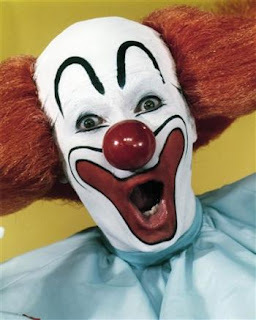 Not to draw a specific comparison with these individuals, but our society is crumbling, and it's in no small part due to clowns in leadership roles, rather than as performers in Ringling Bros. and Barnum and Bailey's Greatest Show on Earth. According to Matthew Holt and Mark Leavitt, Health IT concerns are a laughing matter, expressed by crazy people. I (and many like minded colleagues) don't find healthcare information technology issues a laughing matter, however. More analysis is at E-Health Insider at this link. Why Did US Physicians Give Up Their Ability to Enforce Their Own Professional Standards? In his recent review of Dr Ezekiel Emanuel's book, (Healthcare, Guaranteed: A Simple, Secure Solution for America,) Dr Arnold Relman, Editor-Emeritus of the New England Journal of Medicine, discussed the history of the deprofessionalization of American physicians. This decision had an enormous effect on the medical profession, but its consequences have received relatively little public attention. Although the courts did not initiate the commercialization of medicine, they certainly accelerated it and gave it legal justification. In 1980, after medical organizations lost some costly antitrust trials, in which they were accused of such offenses as limiting doctor fees or denying staff privileges, the AMA changed its ethical guidelines, declaring medicine to be both a business and a profession. This lowered the AMA's barriers to the commercialization of medical practice, allowing physicians to participate in any legal profit-making business arrangement that did not harm patients. The law also has played a major role in the decline of medical professionalism. The 1975 Supreme Court ruling that the professions were not protected from anti-trust law undermined the traditional restraint that medical professional societies had always placed on the commercial behavior of physicians, such as advertising and investing in the products they prescribe or facilities they recommend. Having lost some initial legal battles and fearing the financial costs of losing more, organized medicine now hesitates to require physicians to behave differently from business people. It asks only that physicians' business activities should be legal, disclosed to patients, and not inconsistent with patients' interests. Until forced by anti-trust concerns to change its ethical code in 1980, the American Medical Association had held that 'in the practice of medicine a physician should limit the source of his professional income to medical services actually rendered by him, or under his supervision, to his patients' and that 'the practice of medicine should not be commercialized, nor treated as a commodity in trade.' These sentiments reflecting the spirit of professionalism are now gone. It seems to me that Dr Relman has elucidated one of the "missing links" that help explain the current sorry state of physicians' core values, and the broader continuing health care crisis. I am amazed that this bit of history seems to have been so thoroughly forgotten. Dr Relman did write about it before 2007, but in publications that few physicians and other health care professionals were likely to see. Other than Dr Relman, almost no one writing in the medical and health care literature seems to have interest in this issue. (It has been discussed in the Journal of Health Politics, Policy and Law, and the Stanford Law Review by M. Gregg Bloche, but these unfortunately also could have easily been missed by nearly all physicians and health care professionals.) So we have another example of the anechoic effect. Yet in my humble opinion, every physician and health care professional ought to know that the profession once foreswore the commercialization of medical practice, but gave up on its ability to police its own conflicts of interest after the US Supreme Court decided that professionals are subject to anti-trust law. The Supreme Court decision apparently involved interpretation of law, not the constitution. Therefore, why didn't organized medicine pursue a change in the law that would allow physicians to continue to enforce their traditional professional values? The Supreme Court decision was primarily directed at lawyers, not physicians. Since the decision, to my knowledge, the law profession has maintained strict rules about conflicts of interest. (For example, no legal CME is sponsored by corporations whose products they seek to have the attendees favor.) Why did the decision wreck physicians' but not lawyers' abilities to regulate their own conflicts of interest? The Supreme Court decision only affects US law. Why have physicians in other countries also abandoned their traditional values about commercial entanglements? Why did only Dr Relman and Prof Bloche seem to care about this up to now? Inquiring minds want to know.... And answering these questions might bring us back on the path of true medical professionalism. Hat tip to Merrill Goozner in the GoozNews blog. 1. Goldfarb v. Virginia State Bar, 421 U.S. 773 (1975). 2. Kenneth J. Arrow, "Uncertainty and the Welfare Economics of Medical Care," The American Economic Review, Vol. 53, No. 5 (December 1963). The RUCkus Continues: Former Medicare Administrator Calls the "RUC Process" "Incredibly Flawed," and the AMA Chair Says He's "Inaccurate"
Health Affairs just published an interview(3) with Kerry Weems, a recent administrator of the US Center for Medicare and Medicaid Services (CMS) under the Bush administration, who had some remarkable criticism for the RUC. Iglehart: The last question I wanted to ask you relates to the Specialty Society Relative Value Scale Update Committee [RUC] of the American Medical Association. The AMA formed the RUC to act as an expert panel in developing relative value recommendations to CMS. The twenty-nine-member committee essentially determines, through the relative values it establishes for the codes that form the basis of Medicare payments, how much doctors will earn from providing services to beneficiaries. In recent years the RUC has come under criticism based on the view that its specialty- dominated composition undervalues primary care services and, in some instances, overvalues specialty services. I have two questions, Kerry, regarding the RUC. You have been in government for twenty-six years; have you ever heard of an administration that has seriously questioned the RUC process, and whether CMS ought to somehow internalize it or delegate it to another body? Weems: I think there is a general consensus that the RUC has contributed to the poor state of primary care in the United States. In many ways the supposition behind the RUC process, behind the whole relative value scale, is incredibly flawed. It's an input measurement system, so it asks, What's the cost of my inputs, and that's how I'm going to price my outputs. It has no relationship to perhaps the market value of what you might buy. So because it's highly procedure based, it's prejudiced against just standard primary care evaluation and management [E&M] visits, because in an E&M visit it's hard to document what happens in the same way that it is when you remove a mole, or perform some other procedure. So the process itself is flawed. I don't think that we can make a change without a statutory change giving us the ability to do that. But it's something that is drastically needed. You know, it's funny that we talk about better coordination of care and creating the medical home. Well, the place where this can occur is in an E&M visit, which has been highly undervalued by the RUC. Iglehart: You say that the RUC process is seriously flawed and needs to be overhauled. Was there ever any discussion during the eight years of the George W. Bush administration about doing that? Weems: There were a number of discussions, but it's a hard nut to crack. Those discussions never ripened to the point where we could say we've got something better. Iglehart: But you'd anticipate under the Obama administration that those discussions will continue? Weems: Sure. And, you know, you can even see the early attempts at trying to crack that. Representative [Pete] Stark [D-CA] introduced last year the so-called CHAMP [Children's Health and Medicare Protection Act] bill, in which he proposed to develop a new payment approach that would have provided more money to primary care physicians. He split it up into several different categories. This probably wasn't the right approach, but again, he was trying to work through the problem, trying to provide more money for primary care. His heart was in the right place. First, a former CMS administrator charged that the RUC has a substantial role in the decline of primary care in the US. Such charges have been made by well-reputed academics who have analyzed the role of the RUC from the outside. But as we have said before, aspects of what the RUC does are obscure, especially because the proceedings of RUC meetings are not made public. But now someone more directly involved has made the same charges. Second, a former CMS administrator has called the "RUC process ... incredibly flawed." Even the second Bush administration felt these flaws were sufficient to have "a number of discussions," but found "it's a hard nut to crack." Hence he said that although there is something fundamentally wrong with the "RUC process," the government could not easily fix it. Yet RUC leadership has repeatedly said that the RUC is merely a private advisory committee which gives recommendations to CMS using its rights to free speech and to petition the government. (Note also that above, Inglehart first said that the RUC was formed as "an expert panel" to make "recommendations." But then he said the committee "determines ... how much doctors will earn.") If the RUC is simply an advisory committee, and CMS did not like the advice the RUC was giving, why couldn't CMS leaders simply ignore the RUC? Weems' remarks do not make sense if the RUC is merely an outside private group providing advice. But they do make sense if the RUC is acting like a government agency. So this interview once again raises the question: why does CMS rely exclusively on the RUC to update the RBRVS system, apparently making the RUC de facto a government agency, yet without any accountability to CMS, or the government at large? First, she implied that a former CMS administrator did not know what he was talking about when it came to the RUC. In the interview, inaccurate statements were made about the role of the AMA/Specialty Society RVS Update Committee (RUC), which advises CMS regarding the relative levels of reimbursement for different medical procedures performed by physicians. Now I feel like I am in good company. The leaders of the RUC have charged that I made inaccurate statements about the RUC as well (see post here). However, Dr Patchin failed to identify any particular statements by Kerry Weems or his interviewer as inaccurate, much less provide any evidence to that effect. Note that while the RUC leaders also charged me with making inaccurate statements, they did not specify any particular statements as inaccurate, much less produce evidence in support of their contentions. Every time the RUC has been asked to review payments for E&M (evaluation and management) codes, the RUC has sent CMS recommendations that would lead to higher payments. This may be so, but it ignores an important issue. While the RUC may have made some recommendations to increase payments for cognitive services, it has made many more recommendations to increase payments for procedural services. Furthermore, while payments for individual procedures went up, and the volume of procedures also went up, the global budget for physicians' services, called the Sustainable Growth Rate (SGR), resulted in across the board cuts. Since raises for procedures were larger and more frequent than raises for cognitive services, the net effect was that payments for procedures increased relative to cognitive services. Even more important, it begs that question: what has the RUC done at times when no one asked it "to review payments for E&M ... codes?" After all, the RUC leadership has argued again and again that it is only a private advisory committee (and see below for another such argument). As such, it should be able to choose how often it deals with payments for cognitive services. It should not have to wait to be asked to review them. So why wasn't the RUC reviewing these payments more frequently? To clarify: The RUC makes recommendations to CMS, and then CMS makes its payment decisions. Bottom line: the RUC makes recommendations, CMS makes payment decisions. This, once more, begs the questions. Why didn't the RUC make more recommendations to improve payments for cognitive services? Why doesn't CMS get recommendations about payments to physicians from sources other than the RUC? Why doesn't CMS make the process for setting physicians' payments, and updating and revising the RBRVS system more broad-based and transparent? Why did the administrator of CMS feel unable to change or ignore the "RUC process?" I don't have the capacity to find out the answers to these questions. Answering them might take some investigative reporting, or even a Congressional investigation. Given that physicians' payments are key incentives driving the health care system, and that payments favoring procedures are likely to be a major cause for rising volume and costs of procedures, which, in turn, is likely to be a major reason our health care system is so expensive, why do we know so little about how these payment rates are set? 1. Bodenheimer T, Berenson RA, Rudolf P. The primary care-specialty income gap: why it matters. Ann Intern Med 2007; 146: 301-306. Link here. 2. Goodson JD. Unintended consequences of Resource-Based Relative Value Scale reimbursement. JAMA 2007; 298(19):2308-2310. Link here. Vladimir Martin called himself 'doctor' and ran 17 clinical trials of new drugs for major pharmaceutical companies before one patient noticed he didn't have a medical license. The patient alerted the St. Petersburg Times, whose resulting story led to a state investigation. On Saturday, Martin, 43, was arrested on charges of practicing medicine without a license. He was later released from the Pinellas County Jail on $10,000 bail. The felony charge carries a maximum sentence of five years in prison and maximum fine of $5,000. The Clearwater man, who changed his last name from Kossatchev after moving to Florida in 2003, went to medical school in the former Soviet Union and practiced in a hospital in his native Ukraine. Ruth Weber, a 74-year-old Clearwater resident, told the Times in April 2008 that the man who called himself Dr. Martin enrolled her in a study for lower-back pain and adjusted the dosage of her medicine. Only licensed physicians are supposed to conduct such activities. Patients in the study were randomly selected to receive a new Johnson & Johnson painkiller called tapentadol, a placebo or the potent narcotic oxycodone. Though Dr. Robert Lee Jackson, a Clearwater osteopath, was listed by the FDA as the physician conducting the study, Weber said she never saw Jackson. In weekly visits to Alliance Medical Research Group on Belcher Road, Weber said it was Martin who drew blood, doled out medication and, at one point, doubled her dosage. Martin also conducted electrocardiograms on Weber, although his techniques were so rusty the electrodes kept slipping off, she said. Weber eventually dropped out of the study when she saw no improvement for her back pain. A second woman, Ann Reed, told investigators she also responded to an ad for a drug study trial at Alliance Medical Research. Martin took her blood, listened to her heart and gave her medications, Reed said. Martin sometimes had to stick her four times to draw blood, she said. Like Weber, Reed said she never saw Jackson during her trial, which involved 13 visits between May 2007 and March 2008. Greg Panico, a spokesman for Johnson & Johnson, said the company audited Alliance Medical after the Times' story and submitted its findings to the FDA. He declined to discuss the nature of the report, but said the drug company is no longer working with Alliance Medical. Panico also said data collected in the tapentadol study at that site was not submitted to the FDA. The drugmaker said it reported its findings to the Sterling Institutional Review Board in Atlanta, which had been hired by Johnson & Johnson to oversee patient safety during the trial. Despite losing the Johnson & Johnson trial, Martin told investigators in July that he was conducting four other drug studies. A little Google searching turned up another example on ClinicalTrials.gov of a commercially funded clinical study for which the Alliance Medical Research Group enrolled patients. This was a Phase III study sponsored by Cephalon, an "Open-Label Study to Evaluate the Effect of Treatment With Fentanyl Buccal Tablets on Pain Anxiety Symptoms When Used for the Management of Breakthrough Pain." Note also that Sterling Institutional Review Board appears to be another example of a for-profit, commercial institutional review board. Here we have another example of remarkably bad implementation of commercially sponsored and commercially supervised clinical trials. We have posted a number of times about sloppy and mismanagement of commercially sponsored clinical research, often under the auspices of for-profit contract research organizations (CROs) and for-profit institutional review boards (IRBs). See this 2006 vintage post on the infamous study 3014 on Ketek, sponsored by Sanofi Aventis. In my humble opinion, in the contemporary business world, many managers are driven mainly by quarterly profits. However, what works best to boost profits in the short run may not be what works to produce valid clinical research that maximizes the safety of and respect afforded human research subjects. When all the organizations involved in the research, the sponsor, the organization implementing the research, and the organization supervising research ethics are for-profit, the incentives to cut corners are multiplied. Cutting corners can jeopardize the validity of the studies, and the safety and respectful treatment of study subjects. I again submit that making human experimental research into a commercial enterprise, mainly serving the marketing of drugs and devices, may not produce good science, and may not be good for patients. It might be a better idea to leave human research to not-for-profit organizations and health care professionals. Mark Leavitt, Head of CCHIT: Behind the Times and Uninformed on Health IT Realities? Resorting to ad hominem attacks when questioned or criticized. Deficient familiarity with the current literature. Opining that others' concerns expressed in that literature could be "laughed off." Years-behind view of the situation on the ground. ... Estimates by the Congressional Budget Office suggest the total incentive payout could reach $34 billion, although with expected savings the net cost is half that. Add to that another $2 billion that the Office of the National Coordinator for Health IT can use on various initiatives in support of the goal of having an EHR for every American by 2014. But more important than the money itself is the message implicitly conveyed along with it. Will incentives be perceived as an intrusive, carrot-and-stick manipulation of health care providers' business decisions? Or will health care providers interpret ARRA as the correction of a reimbursement anomaly, welcoming the opportunity to modernize their information management and transform the care they deliver. are easily affected by fear mongering. I'm really tired of amateurish political rhetoric and marketing puffery masquerading as substantive debate on critical issues as above. However, being experienced with EHRs, their design, implementation and lifecycle, and concerned with widespread irrational exuberance over health IT (a facilitative tool that carries risk to patients and medical organizations if not done well) I am not at all "laughing these stories off", and will critique the above in a quite serious manner. Indeed, "laughing off" stories from credible sources and personnel (e.g., many AMIA members) about potential harm from an experimental technology affecting patients seems the height of hubris, or blindness of a kind mediated by incomplete knowledge or conflicts of interest. First, binary thinking. It seems those who critique health IT's drawbacks are "individuals with a deeper-seated anti-EHR bent." That is, they don't buy into the consensus of the industry "experts" and must therefore be biased and wrong. On the issue of ad hominem attacks against questions and critique, I documented those at Healthcare Renewal at "Open letter to Mark Leavitt, Chairman, Certification Commission for Healthcare Information Technology on Penalties For Use of Non-Certified HIT" at this link. Both I and another physician, David Kibbe, MD, MBA, Health IT Consultant at American Academy of Family Physicians, were subjected to "nonlinear" commentary. 1. The article "Health IT Project Success and Failure: Recommendations from Literature and an AMIA Workshop", Bonnie Kaplan and Kimberly D. Harris-Salamone, Journal of the American Medical Informatics Association 2009;16:291-299. DOI 10.1197/jamia.M2997 - and the references cited. There are more than 70 references at the end of this article (See fulltext at link above), and my comments on the findings and recommendations of the multi-working group informatics workshop that created it are in the post "Health IT Project Success and Failure: Recommendations from Literature and an AMIA Workshop" at this link. Common Examples of Healthcare IT Difficulties (my own 10-year-old website). S. Silverstein, MD, Drexel University College of Information Science and Technology. The teachings of the field of Social Informatics about new Information and Communications Technologies (ICT's) and the unanticipated negative consequences they cause. An introductory essay entitled “Learning from Social Informatics” by R. Kling at the University of Indiana can be found at this link (MS-Word file). The book “Understanding And Communicating Social Informatics” by Kling, Rosenbaum & Sawyer, Information Today, 2005 (Amazon.com link here) was based on this essay. 3. The warnings of HIT dangers from the U.S. Joint Commission, the EFMI, as linked above, and others; doubts about cost savings from Wharton and Stanford professors (surely no amateurs). ... I have similar problems with the way President Obama hopes to pay for the huge and costly health reform package he has in mind that will cover all Americans; he is counting on the “savings” that will come as a result of investing in preventive care and investing in the electronic medical record among other things. It’s a dangerous and probably an incorrect projection. It is becoming more common that electronic patient record systems and other systems are interconnected, for instance imaging systems or laboratory systems. It is obvious that such systems should not be regarded as “purely administrative”; instead they have the characteristic features that are typical for medical devices. They sort, compile and present information on patients’ treatments and should therefore be regarded as medical devices in accordance to the definition. Since the electronic patient record system often replaces/constitutes the user interface of “traditional” medical device systems, the call for 100% accuracy of the presented information is increased. Patient record systems have crucial impact on patient safety, and this has been proven to be the case after a series of incidents [including deaths - ed.] that has been reported to the Swedish National Board of Health and Welfare. On wonders if Dr. Leavitt would include the Swedish Medical Products Agency, who incidentally have a cooperation agreement with our own FDA, under the category of "fearmongers." Finally, stories of HIT mayhem of which Dr. Leavitt seems blissfully unaware are making their way to appropriate political circles. The whistleblowers are afraid to speak out publicly due to fear of job loss or retaliation. However, when the case examples do come out, it may be Dr. Leavitt who will be found to be "fear mongering" about those who care more about patients and their rights than about information technology. Health IT Under ARRA: It's Not the Money, It's the Message. Indeed. And Dr. Leavitt's message about those who think critically about health IT seems quite ill informed and mean spirited. Now that we're hopefully past the expected ad hominem, perhaps the real issues can be addressed. As a final piece of advice to Dr. Leavitt, I can add that dismissing concerns of others, Dogbert-style, is not a way to win friends and influence people. Humor and a little humility work much better. Complaints about a contact lens solution linked to a 2007 outbreak of eye infections that blinded several people went unreported by the manufacturer for more than a year, government documents show. The documents show Advanced Medical Optics received complaints about the solution more than a year before it was recalled, and failed to promptly report nine complaints as required by law. The company pulled its Complete MoisturePlus off the market in May 2007 after the Centers for Disease Control and Prevention linked the fluid to dozens of cases of a serious infection called Acanthamoeba keratitis. Lawyers for customers suing AMO obtained the documents, which stem from a previously undisclosed inspection by the Food and Drug Administration, through a Freedom of Information Act request. The papers were obtained by The Associated Press. Of roughly 70 plaintiffs suing AMO and represented by the law firm Schmidt LLP, three had eyes removed, three others suffered blindness and about two dozen had at least one corneal transplant. The others suffered permanent vision damage. Beginning in February 2006 and continuing through November, AMO received a series of complaints about users who were diagnosed with the Acanthamoeba infections. But those reports were not disclosed until June 2007, when FDA inspectors came to investigate the company's headquarters following its product recall. When questioned by FDA inspectors, company officials said they were not obligated to report the complaints because the product's labeling does not say it protects against Acanthamoeba, according to the FDA documents. Kelly Morrison, a spokeswoman for Abbott Laboratories, which acquired AMO in February, said the company 'believed it was reporting customer complaints in compliance with FDA regulations.' She declined to elaborate. Abbott Laboratories is based in North Chicago. That is an original excuse. Did the "company officials" really mean to imply that in the absence of a promise to protect against a specific microbiologic organism, patients and physicians should assume that the product could be contaminated with that organism? This completely ignores the company's basic responsibility to supply a product that is uncontaminated with any harmful organisms, and unadulterated with any harmful substances, and hence to be vigilant for any events that suggest that the product could have been contaminated or adulterated. The "company officials'" bizarre excuse suggest a fundamental lack of comprehension of their responsibilities for the health and safety of the patients using their products. This is a particularly weird example of how little many leaders of health care organizations understand about health care. The Philadelphia VA Hospital has had some problems with brachytherapy (implantation of small radioactive pellets for prostate cancer) recently. Multiple procedures were bungled, including wrong placement and incorrect dosages. ... The hospital suspended the brachytherapy program on June 11 last year. By then, 45 substandard implants had been found. I am uncertain how "computer interface problems" (in the Philadelphia Inquirer, they were referred to as "glitches") prevented medical personnel from determining treatment success over several years. I would be most interested in hearing more about these "interface problems." Did these problems involve the VistA system? What was interfaced to what, exactly? What regulatory authorities validated the interfaces and systems? If no regulatory agency was involved, why not? I have some familiarity with odd events at the Philadelphia VA Hospital. (Not including the fact that I spent a few months there as a medical intern in the early 1980's). In the mid 1990's I took my father there for evaluation for increased service-related disability. He had been treated for skin lesions in the Army in WW2 and after by the VA with Fowler's solution (an arsenical) and as a consequence of this (even then-outdated and dangerous) treatment, had developed widespread basal cell carcinomatosis over a major portion of his body, with chronic bleeding and discomfort. I accompanied my father to the exam but did not identify myself as an MD, only as his son. "Mr. Silverstein said he'd taken more than the prescribed dose of arsenic for years, and even shared it with his wife." Needless to say, I was upset. I confronted the physician who wrote the note, but that physician would not change it, bizarrely claiming that they remembered my father telling that story in a visit several years prior. Needless to say, such a claim violated all the precepts of medical information integrity of which I was familiar. In an initial attempt to counteract this disability exam sabotage, I actually crossed out the statement in the chart, writing "this is untrue" or words to that effect and signed my own name. The head of the Philadelphia VA Hospital would not return my calls on this matter. That is, until Jesse Brown, then Secretary of the Department of Veterans' Affairs, inquired directly a few days later. Unknown to the VA examiners, my father had been sent for the disability exam after reporting problems to Sen. Jay Rockefeller's office about prolonged delays in having his case heard. Sen. Rockefeller's staff had set up the exam! Sen. Rockefeller's staff was rather upset at the story I reported upon my return to New Haven about the bizarre chart fabrication at my father's VA disability exam, and apparently relayed the story up the chain of command, as it were. After that, the head of the Philadelphia VA Hospital really, really wanted to speak to me and called me at Yale several times. He wanted to set up a phone conference between me, himself, and the doctors who'd seen my father. I told his administrative assistant that there was "nothing to talk about", and that the false statement in my father's chart would be removed. Period. I think it was. My father's increased disability was granted in the end, but what was going on here with disability exams was never fully investigated to my knowledge (having done disability exams myself years prior for the regional transit authority, police, fire etc. in Philadelphia, I suspected an "incentive" program to deny vets a disability determination). If I had not examined my father's chart, we might have never known a reason for his being turned down. A culture of honesty and accountability seemed lacking then, and seems lacking now. Let's hope the investigation of these brachytherapy failures and "computer interface problems" is a bit more thorough than in my father's situation. Improving Patient Safety In The EU: HIT Should Be Classified As Medical Devices. And, Can We Drop the "Massive Cost Savings" Fable? Here is some sense on healthcare IT from the European Union, echoing a number of themes I've written about at Healthcare Renewal and my academic site on HIT difficulties and failures. These themes revolve around the consideration of healthcare information systems (increasingly used to mediate many aspects of medical care delivery) as medical devices requiring regulation by transparent and impartial authorities - i.e., without conflicts of interest; the importance of regulation due to the adverse consequences caused by ill designed and/or poorly implemented HIT; the need for validation and postmarketing surveillance of the performance of these systems; and vendor accountability. Correctly functioning Information Technology (IT) systems for health care is a prerequisite for ensuring patient safety. However, applicable regulation is rarely applied, mainly due to the lack of useful guidelines on how to classify the IT-systems [guidelines whose formulation has been resisted for many years by the HIT industry, I might add - ed.] A national working group in Sweden has prepared a guidance report that will help increase compliance with the Medical Device regulation in the EU, thus improving patient safety. For this reason, in 2008 the Swedish Medical Products Agency (MPA) initiated a national working group with the aim of providing guidelines for the classification of IT-systems intended to be used in health care. The working group has now prepared a report, intended to serve as guidance for both manufacturers and end-users. At present, there are no guidelines of this kind in Sweden, or the rest of Europe. “Many parties, including the European Commission, have expressed interest in our work. We believe that it will improve the quality and safety of medical information systems. [Finally -ed.] A common approach to product classification is key” says Lennart Philipson, Scientific Director. One important conclusion from the working group is that the Medical Device Directives is the most suitable regulation to be applied. “Our market surveillance of medical information systems will be based on the conclusions in the report from now on. If a system falls within the definition of a medical device, the requirements for CE-marking [Conformité Européene, a branding mark - ed.] shall be applied” says Mats Ohlson, Chairman of the working group. Manufacturers need to adapt to applicable standards when it comes to quality systems, risk management and usability. They will also need to establish post-market surveillance routines to regularly assess products on the market. The working group consisted of members from the Swedish Medical Products Agency, the National Board of Health and Welfare, the Swedish Association of Local Authorities and Regions, Swedish Medtech, the Swedish Standards Institute, Swedish Electrical Standardization and notified bodies through Intertek Semko. A report entitled "The Medical Products Agency’s Working Group on Medical Information Systems: Project summary" is available in English translation at this link (PDF). Download and read the entire report. A general opinion of the health care providers represented in this Working group is that from a patient safety point of view, it is desirable that stand alone software and systems intended to, directly or indirectly, affect diagnosis, health care and treatment of an individual patient [what I have referred to a "mediating aspects of care" - ed.] shall be regulated under a Product Safety Regulation. The Working group has not been able to define any other appropriate regulation than the Medical Device Directive when it comes to the definition of such systems. Adherence to the Medical Device Directive is important so that manufacturers and clients can work with the same intentions. [I would add that the intentions are not exactly the same; the manufacturers' intentions are, by necessity, to maximize profits - ed.] This project report serves as one step towards the clarification regarding which conditions that shall apply. • that there is no legal requirement that manufacturers of devices in the lowest device classes must have certification for their operational processes to fulfill the Medical Device Directive. The Medical Products Agency has in these cases no mandate to formally demand certification, such as for instance ISO 13485. However, in reality it is still necessary to have some form of a functional quality management system to manage a proper design process for software systems [due to the fact that patients, ethical issues, and human rights issues are involved - ed.] as well as the necessity to fulfill the Post Market Requirements including Vigilance reporting. • that a controlled and standardised verification method when performing installation work in a user’s network, supported by the manufacturer, is an essential supplement to the manufacturer’s CE‐marking and a prerequisite for an acceptable safety level when using the device. 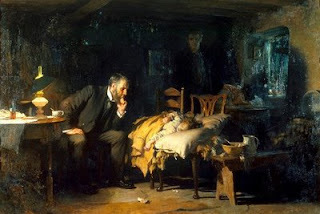 To come back to my favorite painting: a computer cannot take the place of the doctor in Fildes’s painting ["The Doctor", 1891, see below - ed. ]; an electronic medical record (EMR) may or may not save money (it won’t be anywhere as much as is projected) but what it will do is ensure that we doctors, nurses, therapists, particularly in hospitals will be spending more and more time focused on the computer, communicating with each other, ordering and getting tests, buffing and caring for our virtual patient—the iPatient is my term for this phenomenon—while the patient in the bed wonders where everybody is. Having worked exclusively for the last seven years or so in hospitals that have electronic medical records (EMR), I have felt for some time that the patient in the bed has become an icon for the real focus of our attention, the iPatient. Yes, electronic medical records help prevent medication errors [only when done well, see Koppel - ed.] and are a blessing in so many ways, but they won’t hold the patient’s hand for you, they won’t explain to the family what is going on. I will go a step further. It is now clear that the promises of massive savings from electronic medical records, usually originating from vendors based on hearsay or cherry-picked, favorable but flawed studies that dismiss a growing body of other literature (such as in Cerner CEO Neil Patterson's hyper-ebullient piece here), have been deliberately manufactured by a lobby of industry pundits. ... A letter I had written [in Feb. 1999 - ed. ], "Broken Chord" published in the journal Healthcare Informatics, further amplifies the skills and experience issue. The letter addressed issues of skills, insights, and roles of MIS personnel in healthcare settings. I described a Microsoft Healthcare Users Group conference attended predominantly by healthcare MIS staff and vendors, where I observed a panel discussion moderated by the CEO of HBOC [before he was found to be cooking the books - ed.] and composed of several other industry CEO's. The panel was discussing how they would revolutionize healthcare through their leadership in information technology. During the Q&A period I asked the audience how many really felt they would revolutionize medicine through their leadership in IT. Several hundred--almost all in the audience--raised their hands. I then asked how many had ever taken care of patients or examined any textbook of medicine, such as Harrison's Textbook of Internal Medicine or the Merck Manual. A minority of hands went up. This suggested, in my view, a striking deficiency of knowledge, experience and insight on the part of the de facto clinical information technology leadership, complicated by rather cavalier attitudes regarding the essential role of clinical expertise. I believed what I was hearing to be irrational exuberance, not manufactured exuberance. Quality improvements are possible under the most controlled of environments, such as here (such projects are not easily portable, unfortunately). Massive cost savings? When organizations are spending upwards of $100 million just for system implementation, not including ongoing lifecycle costs, massive savings projections from HIT are risible. One would think that after Madoff, Stanford and other recent financial confidence scandals, that bright people would be more skeptical of "massive returns, always and forever" promises, but that does not appear to be the case. With regard to mass savings, I make the prediction that in 2014, as in the UK today, our government, healthcare management, and medical professionals will realize, Madoff style, that they've been had. So, Health IT Industry executives, pundits, and consultants, can we drop the grandiose "we will revolutionize medicine!" and "massive savings" myths, and focus on facilitating clinicians and on quality improvement, please? The U.S. Food and Drug Administration (FDA) and Sweden's Medical Products Agency are no strangers. Richard Scrushy was hit with a staggering $2.88 billion civil judgment in a suit brought by HealthSouth Corp. shareholders, one of the largest findings ever from the era of massive corporate scandals. The plaintiffs said that the former chairman and chief executive helped artificially inflate HealthSouth's earnings for at least six years through an accounting scam uncovered in 2003. Lawyers said Thursday's judgment appears to be the largest financial penalty ever levied against a single executive. Mr. Scrushy was once the poster child of highflying CEOs. He was paid salary and perks of as much as $40 million a year, performed at company events in his country band and traveled on one of a fleet of corporate jets. Mr. Scrushy hosted parties on the Chez Soiree, his 92-foot yacht, and arranged to pay for breast augmentation for a member of a company-sponsored singing group. Judge Horn said Mr. Scrushy either knew or should have known about the fraud, giving no credence to Mr. Scrushy's repeated insistence that subordinates perpetrated the scheme without his knowledge. Note that Scrushy had is already a convicted felon, "as he is two years into a seven-year sentence in federal prison on the bribery conviction." He has gone from being a "poster-child" for the high-flying health care corporate CEO to being a poster-child for liars and criminals fraudulently leading health care organizations. So I get to say it again: instead of focusing on the reform of health care finance, we should be focused on the reform of health care leadership. We have set up a system that rewards imperial health care CEOs with the the lavish life-style and power that used to be reserved for the aristocracy. We have attracted health care leaders who value their own wealth and power ahead of patients' welfare and safety. To improve health care, we need responsible, ethical, honest stewardship of health care organizations. If we do not improve health care's leadership, it will not matter whether we finance it via private insurance, public options, or single-payers. A Swiss company with major operations in West Chester illegally tested its bone cement on about 200 people, three of whom died, according to a 52-count indictment issued yesterday by the U.S. attorney in Philadelphia. Synthes Inc., a producer of orthopedic products that employs about 1,400 in Chester County, did not tell any of the patients that they were participating in experimental surgeries, the indictment said. Federal prosecutors also accused Synthes executives of lying to the U.S. Food and Drug Administration about whether they had tested the product for uses that the agency had not approved. Particularly striking were allegations that the company's CEO was directly involved in the decisions. The FDA had approved Norian XR to fill bony voids or defects in some parts of the body, but not in the spine. The agency insisted that Synthes conduct clinical trials, which are lengthy and expensive and require FDA oversight, if it wanted to expand the uses of Norian XR to treat spinal fractures. But, a company executive identified in the indictment as 'Person No. 7' decided not to conduct clinical trials. Instead, the person said the company should 'get a few sites to perform 60-80 procedures and help them publish their clinical results,' according to the indictment. The report never explicitly identifies 'Person No. 7,' but says he was the chief executive officer and a large shareholder. A company spokesman identified Hansjörg Wyss as the CEO while the tests occurred. Forbes Magazine lists Wyss, a Swiss citizen, as a West Chester resident and the Philadelphia area's wealthiest person, with a net worth of $5.7 billion. Last year, Wyss gave the largest amount from a single source in Harvard University's history when he donated $125 million to create a bio-engineering institute. Wyss owns about 40 percent of outstanding Synthes stock. The company, which had about $805 million in first-quarter sales this year, specializes in orthopedic devices, including plates and screws. Instead of conducting trials with FDA oversight, Synthes executives convinced about 50 surgeons to test Norian XR in people with spinal fractures. Synthes sales representatives often were in the operating room during the surgeries, including those where patients died, prosecutors said. When company executives began these surgical tests in 2002, they knew that Norian XR caused blood clots in test tubes and that clots became lodged in the lungs in tests with pigs, the indictment said. Synthes continued the experimental surgeries even after two patients died on the operating table, prosecutors said. The company stopped the tests after a third patient died in January 2004. Again, it seems that the current leaders of health care all too often put more priority on personal profits than on protecting patients' health and safety. So instead of all the talk about reforming how health care is financed, maybe the conversation should be about reforming how health care is lead, and finding ethical, honest leaders who put patients' welfare ahead of their own wealth. We have posted before about how certain health care insurance companies/ managed care organizations in California were found to have cancelled individual health insurance policies after the people holding them made substantial claims, supposedly rationalized by minor errors or omissions in the information the people supplied to the companies on their individual applications found after the claims were made. Several companies were subsequently disciplined by the state government for these "rescissions." See posts on rescissions by WellPoint here, here, and here, and by Health Net here. The committee's investigation found that WellPoint's Blue Cross targeted individuals with more than 1,400 conditions, including breast cancer, lymphoma, pregnancy and high blood pressure. And the committee obtained documents that showed Blue Cross supervisors praised employees in performance reviews for rescinding policies. One employee, for instance, received a perfect 5 for 'exceptional performance' on an evaluation that noted the employee's role in dropping thousands of policyholders and avoiding nearly $10 million worth of medical care. The executives -- Richard A. Collins, chief executive of UnitedHealth's Golden Rule Insurance Co.; Don Hamm, chief executive of Assurant Health and Brian Sassi, president of consumer business for WellPoint Inc., parent of Blue Cross of California -- were courteous and matter-of-fact in their testimony. But they would not commit to limiting rescissions to only policyholders who intentionally lie or commit fraud to obtain coverage, a refusal that met with dismay from legislators on both sides of the political aisle. Sassi said rescissions are necessary to prevent people who lie about preexisting conditions from obtaining coverage and driving up costs for others. 'I want to emphasize that rescission is about stopping fraud and material misrepresentations that contribute to spiraling healthcare costs,' Sassi told the committee. But rescission victims testified that their policies were canceled for inadvertent omissions or honest mistakes about medical history on their applications. Rescission, they said, was about improving corporate profits rather than rooting out fraud. This is just amazing. Here are executives of three of the country's largest for-profit health care insurance companies/ managed care organizations asserting they will continue cancelling peoples' policies after they make claims, simply because of minor errors or omissions in the application documents that have no bearing on the particular claims, or on discrepancies between information provided by patients and doctors, given that patients may not have full access to or understanding of what is in their charts. What good is an insurance policy that is liable to be cancelled as soon as one makes a claim on it? Whatever these companies are selling, it is not insurance. Basing our health care system on their products is foolish, but that is what we are doing, and what many political leaders would continue to do. In my humble opinion, if we are going to have a system based on privately provided insurance, that insurance has to be honest, unlike what some of our largest insurance companies seem to be peddling.